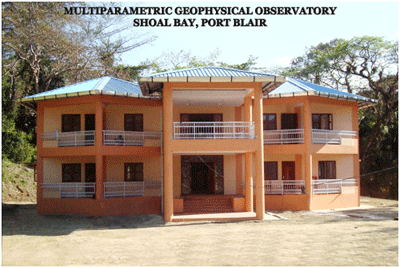 MULTIPARAMETRIC GEOPHYSICAL OBSERVATORY, Indian Institute Geomagnetism, Shoal Bay No - 6, South Andaman (India), Pin Code - 744 206. Port Blair M.O. (2010) was set up as a Multi-Parametric Geophysical Observatory to monitor seismic and co-seismic signals by using multi-techniques.